A South Indian delicacy, Appams are these crisp round dumplings ,traditionally prepared with fermented rice flour batter.The sweet variation of these are usually made with combination of wheat and rice flour or simply rice flour.Enriching the appams with fiber rich fruits like apples or bananas makes the appams all the more nutritionally appealing.And I recommend brown rice instead of plain white rice,for all its benefits. The appams can either be deep fried in oodles of oil or cooked in this special appam pan with just enough oil.This extraordinary pan is sold in most well-stocked Asian Stores and also be bought online. I bought mine during our last visit back home,a keeper for those of us who refrain from deep frying.If you are not lucky enough to find the pan,the recipe can still be used to make good old pancakes. 2 medium organic apples*,finely grated. In a large mixing bowl mix the flours,ground cardamom and salt.Add the sweetener(sugar or jaggery),coconut,apples in to the flour mixture,pour milk and make a thick batter if using the special appam pan.If you do not have the special appam pan,use the same batter to make pancakes,just add little more water to thin the batter and also mix in 1/2 teaspoon of baking powder in to the batter. Heat the pan on medium heat,smear little oil in each of the cups in the pan.Use a ladle and pour the batter in to each until 3/4th full.Let cook for 4-5 minutes on each side,until the center is firm, cooked through and the top is crisp and brown.Serve warm for breakfast or evening snack. A question for my South Indian Audience? A clear cut difference between the similar sounding, Appams and Aapams? Appams are more like dumplings were are Aapams are like mini dosa,very crisp made with fermented rice flour and coconut milk. 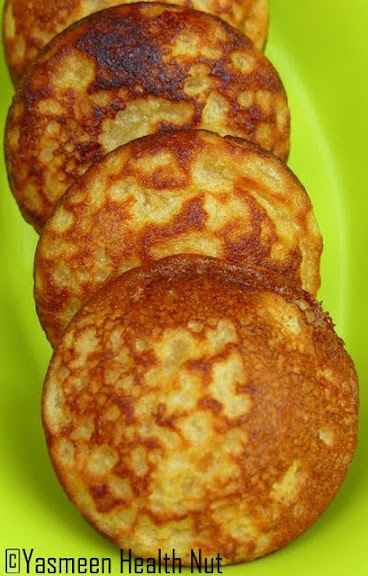 Regarding appams they are sweet and usually made with rice and jaggery, banana fried in oil. where as apams are made with rice and coconut milk fermented with yeast or toddy. first one is a snack, second one is a breakfast dish. What a great snack! That treat reminds me a little of Abelskiver. 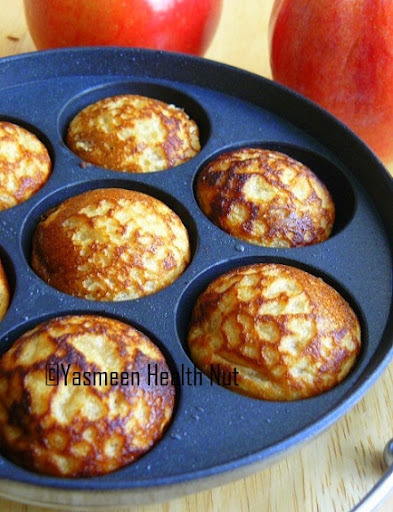 These appams look delicious! They must be wonderfully chewy and crisp on the outside. They remind me too of Abelskiver pancakes. Appams looks super cute and yummY..delicious snack.. Delicious and nutritious variation.Appams are more like dumplings were are Aapams are like mini dosa,very crisp made with fermented rice flour and coconut milk. 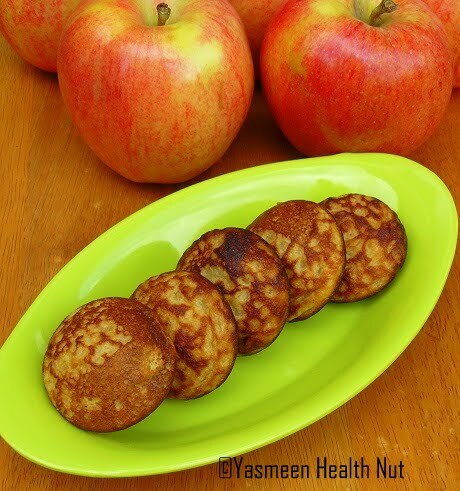 Apple appam looks delicious. Regarding appams they are sweet and usually made with rice and jaggery, banana fried in oil. where as apams are made with rice and coconut milk fermented with yeast or toddy. first one is a snack, second one is a breakfast dish. The flavors are making me want to have a few right out the picture. They look delicious. Mash Allah, the app ams sure look delicious! This looks delish but cant buy any of these where i live --too bad! I got a takoyaki/ebleskiver pan for Christmas and I love this whole-grain version with apple. I can't wait to try this out! I don't have brown rice flour - do you think glutinous rice flour could substitute? Thanks! I just see the difference is size between both. I don't know what is other difference between both. Hey, I like cookies a lot and I like to experiment with different cookies.I try this recipe this weekend.Thank so sweet thanks for the recipe to make cookies. These 3 studies from major medical journals are sure to turn the conventional nutrition world around!